The attempt to simulate dialogues in Natural Language by a machine requires extensive analyses of Natural Language's expression and content phenomena. Carefully deducted natural laws must be extracted. A division of all existing Natural Languages into carrier systems of a) agglutinated and b) isolated mor- phological structures appears to be of principal significance. Thus morphology can be clearly separated from syntax. While morphology concerns structural phenomena, syntax refers to functional customs and rules of language expressions. Expression morphologies of usual language systems like English, French, German or, Russian exhibit tightly agglutinated characteristics. A smaller portion of Natural Language carrier systems provides morphologies of considerably less degrees of agglutination. Among them are ideographic-, pictographic-and, gesture systems as well as air-controller and children languages within a certain phase of development. Sometimes fully self-explanatory or content-related expression units within carrier systems of isolated morphologies guarantee significant insights into phenomena of Natural Language's content. Therefore evaluations on Natural Language expression structures can never be limited exclusively to auditive and phonographic morphologies. They also incorporate transport means of ideo- and pictogenetic characteristics, in order to evaluate morphology and syntax distinctively. The process of formalizing Natural Languages is highly interdisciplinary. It consists of 1) analyzing, 2) possible enumerating, 3) optimizing, and 4) synthesizing procedures. 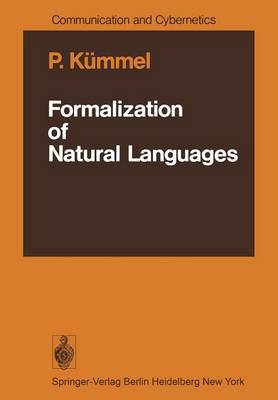 Irrelevant domains of formalization excesses are avoided by keeping strictly to definitions demarcating natural from artificial languages. Comparative evaluations of agglutinated as well as isolated morphologies are necessary.